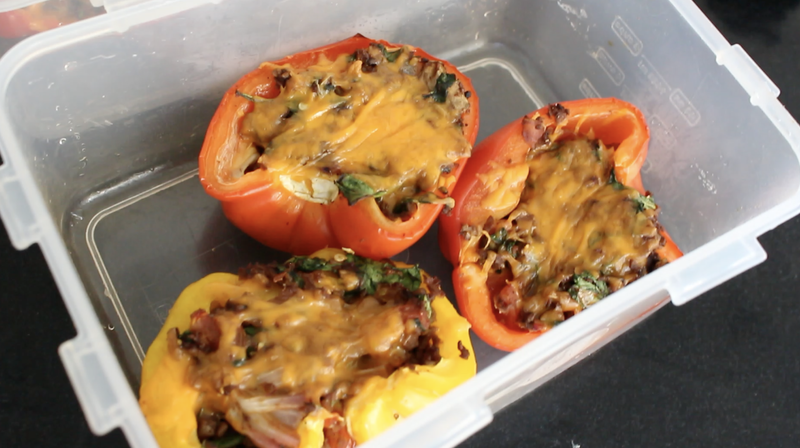 See this recipe demo in my Back to School Meal Prep Video! 3. Heat frying pan on medium with oil, add TVP, onions, tomatoes mushrooms. Add more water if TVP is dry. 4. Add BBQ sauce, chili powder, chipotle powder, chili flakes and garlic to TVP. Add spinach to cook down. 5. Prep peppers, cut them in half, toss with olive oil and salt/pepper. 6. Full peppers with cooked TVP mixture and top with grated cheese. 7. Bake in oven for 30 minutes or to preferred doneness.